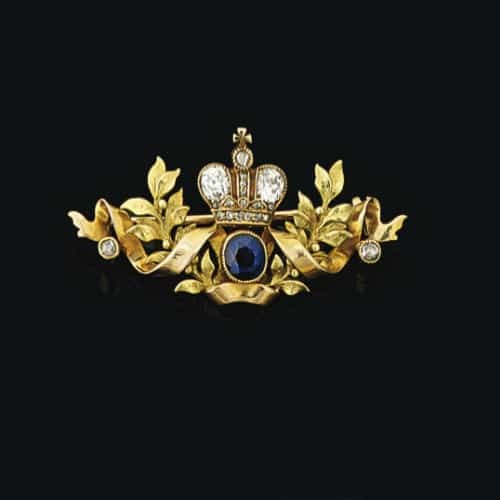 Sapphire and Diamond Bi-Color Gold Brooch by Tillander c. 1900. Photo Courtesy of Christie’s. The Finnish company, A.Tillander was founded by Alexander Tillander who, as a young boy at the age 11, was sent out to go and take up an apprenticeship at a barber in St-Petersburg. Things didn’t go as expected and he ended up at a Finnish master goldsmith’s workshop instead. After 7 years as an apprentice, Alexander started working for a German master named Carl Becks who was a supplier for the Russian Imperial court. In 1860, at the age of 23, Alexander started for himself in St Petersburg. Working hard, his business evolved into a successful company renowned for its quality workmanship. Following the trends of the time, Tillander produced a lot of classical revival jewelry featuring filigree and granulation over the 1870’s and did well with objects d’art made of precious materials. In 1891, Alexander’s son, Alexander Jr., returned from a three-year journey which had led him through three different European master jewelers and gained him the position of representative of a Parisian manufacturer of diamond jewelry. Doing well for himself he became a part of the family business which he expanded with an export business of the now very popular Russian gemstone, demantoid, as well as by opening up a new branch of the business which bought and sold second-hand jewelry. At the beginning of the 20th century, he ran the entire operation by himself and business was booming. The first Russian Revolution in 1905 didn’t affect the business too adversely and up until 1916 the company kept its head well clear of the water line. The overall misery of the first World War followed by the Bolshevik Revolution finally took its toll, however, as it did for every other Russian jewelry manufacturer. Although the Tillanders were prepared and had secured a good part of their assets abroad the anarchy that followed the 1917 revolution proved to be no healthy climate for a jeweler and the St-Petersburg shop was closed. Alexander Sr. was shot by bandits two months after the shop closed and died a year later in 1918. Alexander Jr. didn’t return to St Petersburg after the family’s summer holiday to Finland in 1917. When by 1918 the dust settled after a short civil war, he partnered up with a Finnish jeweler named Viktor Lindman before reestablishing the family company in Helsinki where it still resides today, now in the hands of the fourth generation of Tillanders. The Master Jewelers, Thames & Hudson, London, 1990.